"Avocado is mashed until it turns into a paste with lemon juice and pepper. Absolutely original, it is a fantastic combination." Mash the avocados, lemon zest, lemon juice, sugar, and parsley together in a bowl. Set aside. Heat the olive oil in a skillet over medium-low heat; cook the garlic in the hot oil until slightly browned, about 5 minutes. Add the prawns and increase heat to medium. Season with salt and pepper. Cook and stir the prawns over medium heat until they begin to change color. Reduce heat to low. 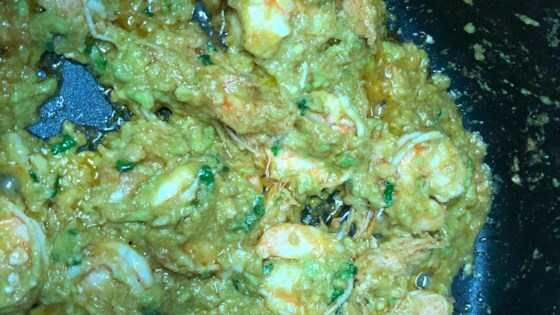 Stir the avocado mixture into the prawns; cook until the avocado is completely heated, about 2 minutes. Garnish with a little bit of black pepper to serve. It's really good but a lot of avocado. I used half the recommended amount and I put it over pasta and it was great. I made this recipe for my family along with stuffed mushrooms. The mushrooms were a hit but no one liked the prawns. Unfortunately, I will not be making this recipe again. Original and refreshing way to make butterfly shrimp! Go easy on the lemon and add a bit of white wine to make a reduction in the pan. Highly recommended. this was very good, very fresh flavour. I did however tweak it a bit, to make the sauce a bit more pastier and smoother. but it was a hit and will definately be making this again.